After a year or so offline due to changes in circumstances, Darren and I are delighted to share that all the This Week in Lotus archives are coming back online via a brand new WordPress-based site. So far, 30+ of the episodes and their show notes are available and, all being well, the rest will be online by the start of next week, to be followed by the original comment threads. We regularly get requests from loyal listeners to make the old shows available, and it’s been regrettable that they’ve been offline for so long. I certainly feel as though the shows themselves, the topics we discussed and the memories we shared over those two and a half full-on years between May 2010 and January 2013 are part of the long and winding heritage of Lotus, and it’s important that they remain online. So, we both hope you enjoy looking and listening back through the archives as much as we do! So, sorry to have missed a week, but enjoy the conversation and appreciate the tiredness of these seven ‘Thursday at Lotusphere’ panellists! Thanks to the gracious assistance of the organisation team, we will be hosting a live panel discussion with studio audience on Thursday morning at 8:15-9:45am in Dolphin Europe 6. We think this is a perfect spot as we can review the conference in detail and this fits in just before the final-day events over at the Swan (Gurupalooza, Ask the PMs, Ask the Developers). We realise we are up against some terrific sessions, but that is true of any slot during the Lotusphere week. As usual, we’ll have a group of the finest guests from the community, including IBMers, partners and customers. We’ll be reviewing the conference OGS, Lotusphere sessions, BoFs, the labs, events over at the new Connect event, the big product launches and updates. So, please mark 8:15 – 9:45 on Thursday in your very busy Lotusphere diaries (we’ll look to kick off recording before 8:30), and make sure you’re there – it’s definitely one Lotusphere event not to be missed! Do you want to raise awareness of your Lotus IBM Collaboration Solutions-related product, solution or company? If you do, there’s really no better way than to sponsor the This Week in Lotus podcast. 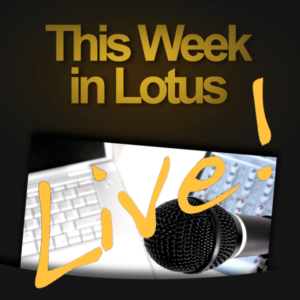 With thousands of downloads every episode, a growing audience, a weekly panel of esteemed guests from IBM and around the community, regular live shows from Lotusphere and the user groups and an ever growing following on the social networks, This Week in Lotus is a perfect vehicle for your message to be delivered to prospective customers. If you’re interested in using your marketing budget to raise your profile through innovative advertising and to support a community podcast at the same time, contact us to receive a copy of our media pack. Unofficial video recording of This Week in Lotus live from UKLUG 2011 is now available. Recorded by Lisa Duke, this is a video record of the conversations that took place. If you’re looking for great audio, check out the podcast version instead – this one is a little more home-made in quality terms! After nearly 12 months and 50 episodes, we’ve reached the top! Yep, we’re top of the hot blogs on PlanetLotus. Sure, it’s just a statistic, and likely a short lived one too. But we’d like to think it’s significant – a podcast is popular enough across the community to get a volume of click-throughs to rate as the most popular site, and that’s on top of the hundreds that subscribe to the podcast through iTunes or go direct to the site. That’s always been the aim, to create a show that’s popular, topical, constructive and relevant across this great community – to further the case for Lotus and IBM Collaboration Solutions software products, to debate issues and topics of relevance to users and prospective users, to add value to efforts by the community and to support those that do great work in their fields. It seems to be working – would you agree? So, after 50 episodes in 50 weeks, we speed headlong toward our anniversary. Just to break with tradition, we’re going to celebrate the occasion a week late, in episode 53. We’ll be live that week at UKLUG in Manchester. Our hosts Warren and Kitty Elsmore (and the team) have kindly given us permission to record a live show during the lunchtime period on Monday 23rd May. We’ll have a stellar panel of experts (UKLUG speakers, organisers and attendees), the usual list of topics to debate and tips to share, plus a few great surprises to throw in as well. If our Lotusphere Live show is any example, it should be a great experience for all – good fun, topical debate and humour too. Of course, we’ll be posting the audio as our podcast for that week too. All of us at This Week in Lotus (Stuart, Darren and Lisa) would like to thank you for your support and feedback through the past 50 shows, and especially to all our great guests that have given up their time to take part. Without it, there would be no This Week in Lotus show. Thank You. Here’s one session at Lotusphere you cannot miss… This Week in Lotus – Live! The show will be recorded and posted ASAP for the folks that are not at Lotusphere. We’ll be releasing the panel line-up over the next week, so look out for that! Ben Langhinrichs has already been good enough to add the session to his Database, so mark it in your diary now. This is a great time slot, just before the Lotusphere Party, so come on over to the Swan, grab a coffee and lean back to listen to the show.